I guess it began with the songs. Firstly I had taken lyrics from Shelley’s Ode to the West Wind and used them in a three minute guitar-based song Wild Spirit, then I had used the first and last verses of Keats’s To Autumn to create a song version of the poem that someone recently described as a piece of ‘slow rap’. 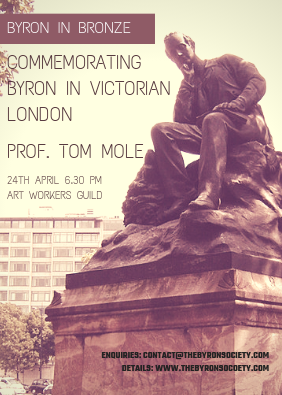 Then a tune came to me that went with Byron’s ‘So we’ll go no more a-roving’. They were all three-chord songs but hell, I was just starting out and anyway, Woody Guthrie used to say that his three chorders always went down the best. On a visit to Pisa my girlfriend and I had blagged our way into the Palazzo Lanfranchi and had been shown Byron’s study there; it had really stayed in my imagination as the place where Byron, Shelley and the other members of the Pisan Circle had gathered. And another song came of that, ‘Half a Scot by Birth’ (with verses from Don Juan, written in that very room). It was Byron remembering his Scottish boyhood and making peace with the land you can tell he knew he would never see again. Call me sentimental, but I shed a tear or two when listening back to it for the first time in my colleague Dave Eastoe’s studio. He had included Scottish fiddle and English brass band sounds in the backing to convey Byron’s background. In time I amassed a total of seven songs, and after researching the dozen or more accounts of Byron’s journey to Greece put together a script with narrative, dialogues and the songs that took Byron from Ravenna to Missolonghi. So there it was, ‘Lord Byron and the Greek War’, and after I had recorded ‘The Shelley Story’ with Benjamin Zephaniah (a self-confessed Shelley fan) asked him if he could also do the narration for something on Byron. ‘Sure, he was one of the gang’ he replied, and we took ourselves off to a small independent recording studio adjacent to RAF Benson in Oxfordshire. It was sited in a prefab that had served in the war as a chapel for RAF crew heading off ‘for freedom’s battle’. Once it was completed I found the CD that resulted a bit difficult to market (not my strength at the best of times), but now in the internet age, and with streaming becoming a medium of choice, I enjoy the fact that it’s out there in cyberspace, There is the whole recording available, and also the songs separated out under the title ‘Courageous Heart: seven Byronic songs’. It’s a thought-provoking story, downbeat in a way, ending in what Richard Holmes called a ‘harsh and disillusioning’ time in Missolonghi, but for me it’s where Byron really showed his true nature. When Iraqi exiles were all lobbying for their agendas in Washington DC before the second Gulf War I thought of how Greek factions had all lobbied Byron on Cephalonia and how wisely he had found a way through their competing stories. And his line ‘I come to serve the Greeks on their own terms and in their own way’ has a beautiful humility to it. It was in essence an early example of liberal interventionism, and Byron found himself in maelstrom of factions, clans and tribes that were equally as complex as those currently encountered in parts of the Middle East. On the technical side two things could have been better: unfortunately (as a resident of Aberdeen pointed out) I mispronounced ‘Balgownie brig’ in the Half a Scot by Birth song (am trying to fix that), and as someone else said Lady Blessington (who has a section of dialogue) should have had a ‘soft Irish accent’. But resources were limited, and vocalist and flautist Ruth Murray does a good job. One thing leads to another, and I have been re-editing it and adding contemporary images to turn it into a video presentation with an eye to perhaps showing it to poetry or other groups. Even if it lacks a conventional Hollywood narrative ‘arc’, it’s a story of courage and tenacity (and ultimate triumph) to encourage us in our own difficult times. As the historian Owen Chadwick, who used to lecture on Byron’s Greek venture once told me (referring to Byron’s refusal to leave Missolonghi), it was ‘big stuff’. 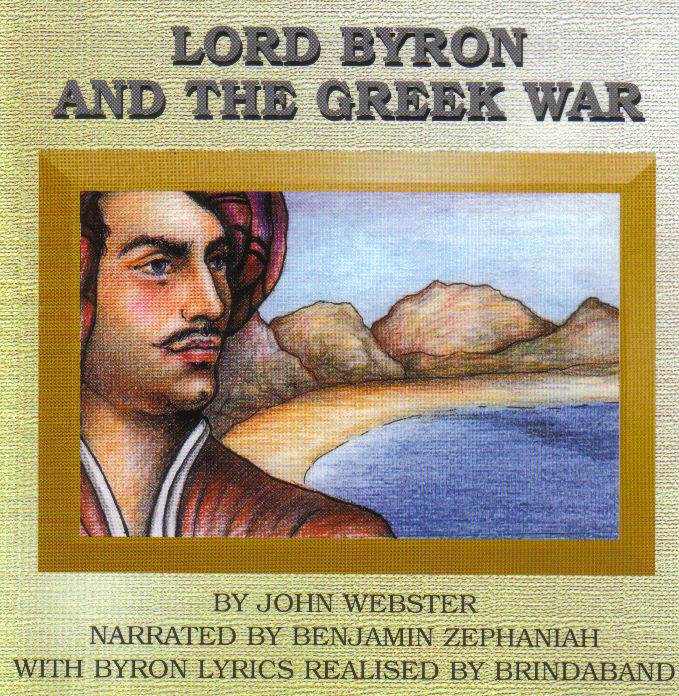 Listen to Lord Byron & the Greek War on Spotify.